Day 13: It’s kitchen tour time! Steven and I consider ourselves lucky. In the notoriously expensive Montgomery County housing market, we snagged a low-priced rental when we moved here two years ago. We rent a condo, and our landlord is responsive, friendly, and fair — he hasn’t raised our rent the two times we’ve re-signed the lease. And we have a great kitchen! Many of the units in our complex have a small kitchen and a small dining room, but ours has an open floor plan — you can see where the wall used to be in the photo below. We’ve got a huge island/eating area, and a massive amount of storage. See that big wall of cabinets? We have a coat closet, pantry, and all our dishes in there! And there’s Moria wondering what I’m doing. I’ll start at the left in the panorama photo. My favorite part of my kitchen! We got this little piece for $5 at a yard sale — what a steal. Inside is our recycling bin and some random stuff. 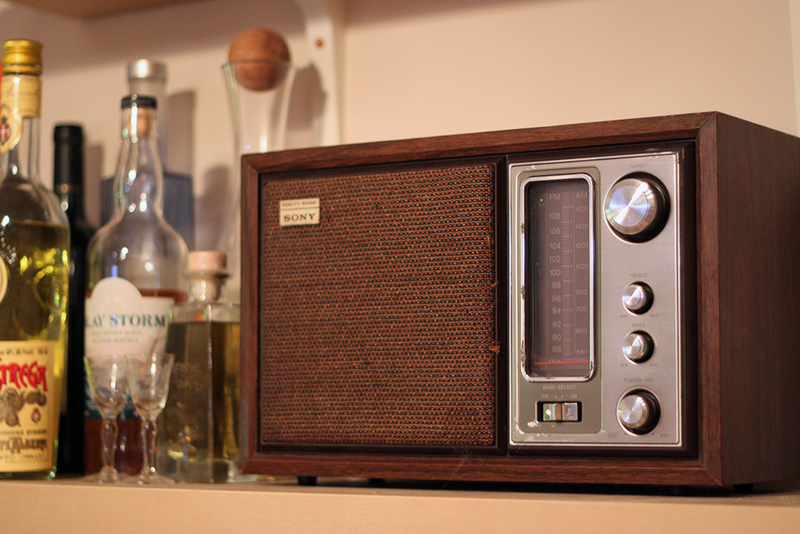 This radio doesn’t work, but it’s so pretty. Steven’s mom gave me those darling aperitif glasses; they’re from her side of the family. 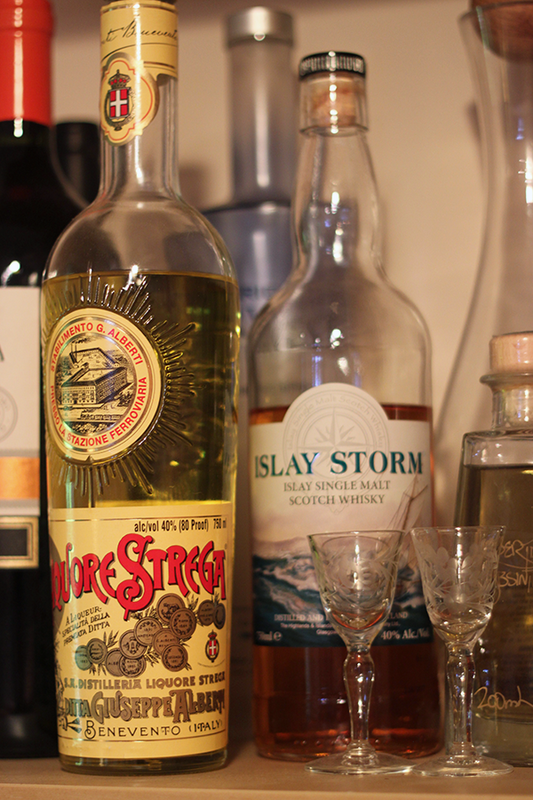 And I love the design on the Strega bottle. 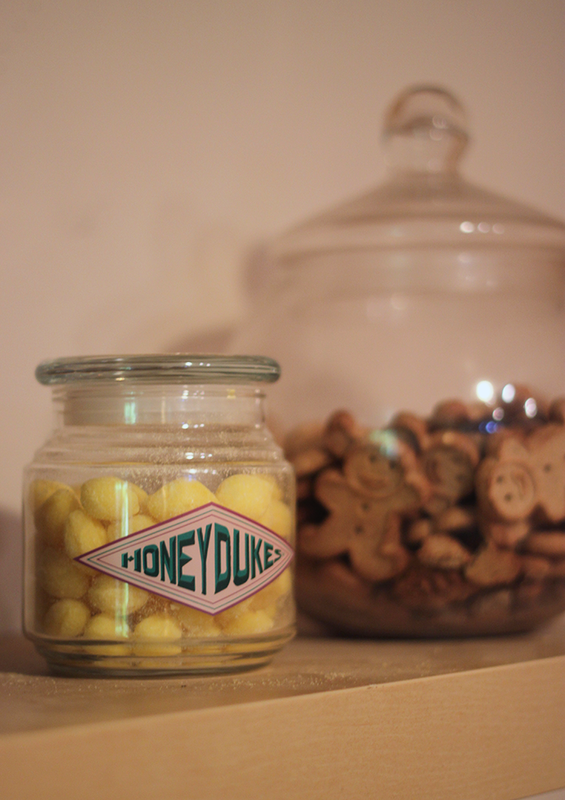 The other side of that shelf houses our spoils from Honeydukes (!) and a jar of doggie treats. I love the jar — Steven found it on the “free table” at work. 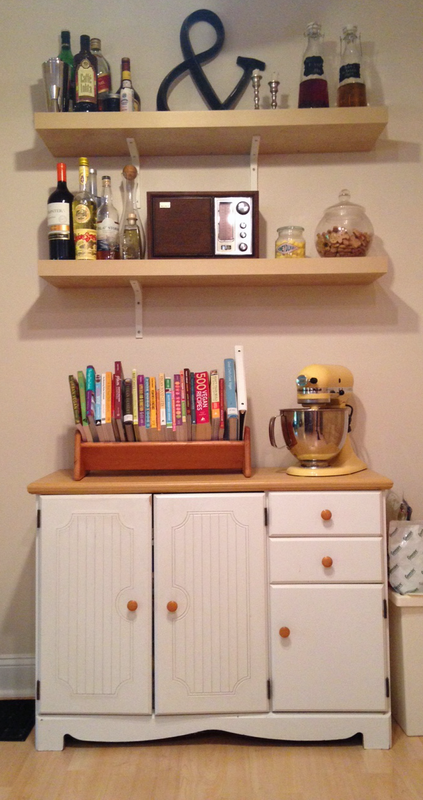 My cookbooks and my KitchenAid — two essentials! My grandfather was an avid woodworker, and he made that little bookholder. 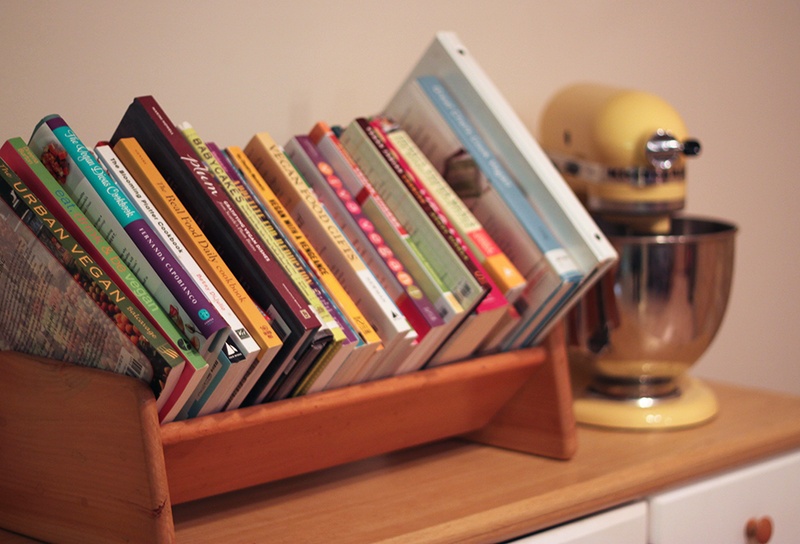 I use it as a benchmark for my cookbook collection — if it starts overflowing, it’s time to donate a few items to the free table! To the right of the fridge is a set of shelves where we keep some pantry staples and all our coffee- and tea-making implements! There are whole beans in the red tin, and coffee from Café du Monde too. My friend gave that to us as a thank-you for watching her pup. We use a Baratza grinder (bottom left), and it’s fantastic. Between that and the Chemex, you can make a great cup of coffee. I like to use the Moka pot when I want a smaller serving. To the right of the sink is [some of] my beloved Pyrex collection (the little blue bowl is in the drying rack! 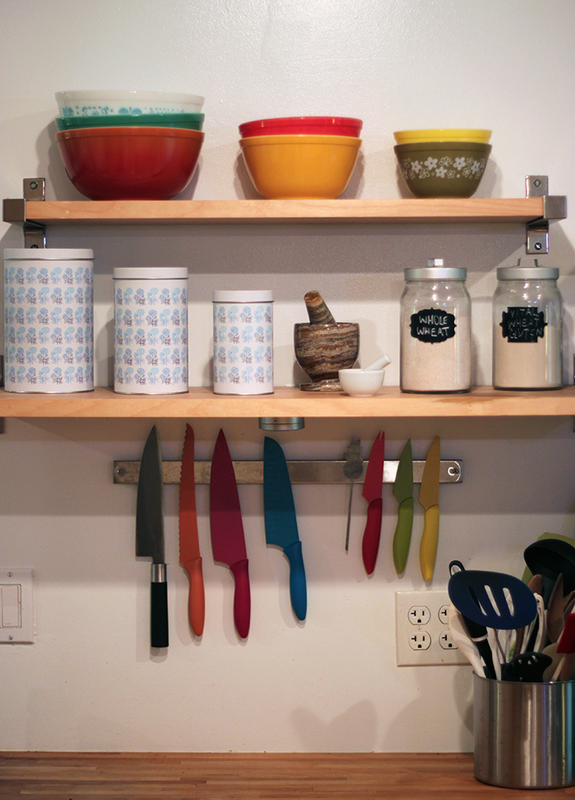 ), along with more pantry staples and our knives. You can see the butcher block counters, too. I don’t love them, especially near the sink where they get wet easily. They’re fine for the island, but impractical for most everywhere else. 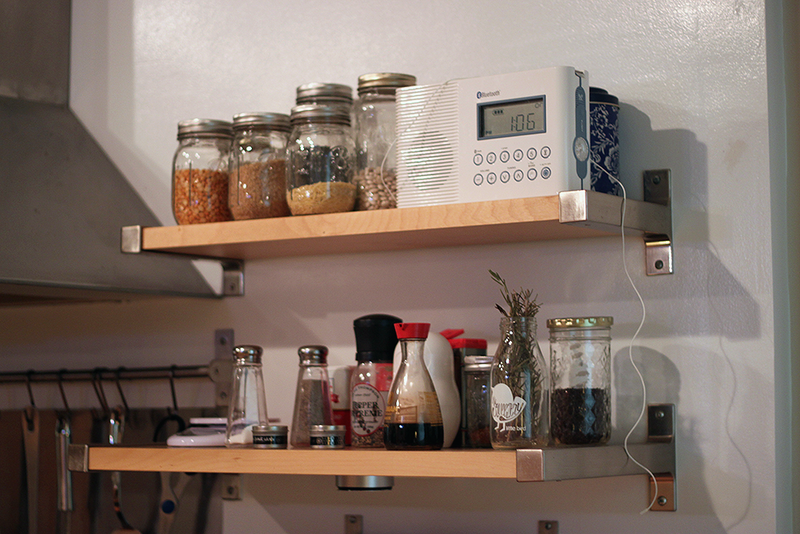 To the right of the sink are more dry goods, spices, a few condiments, a scale, and the radio — because you have to listen to NPR while cooking or cleaning! There you go! A short tour of my current* kitchen. I can’t wait to see yours! *Steven and I are house-hunting! AHH! Wow you have so much cool stuff in your kitchen! I love that you have a nice big table for people to hang out at too. 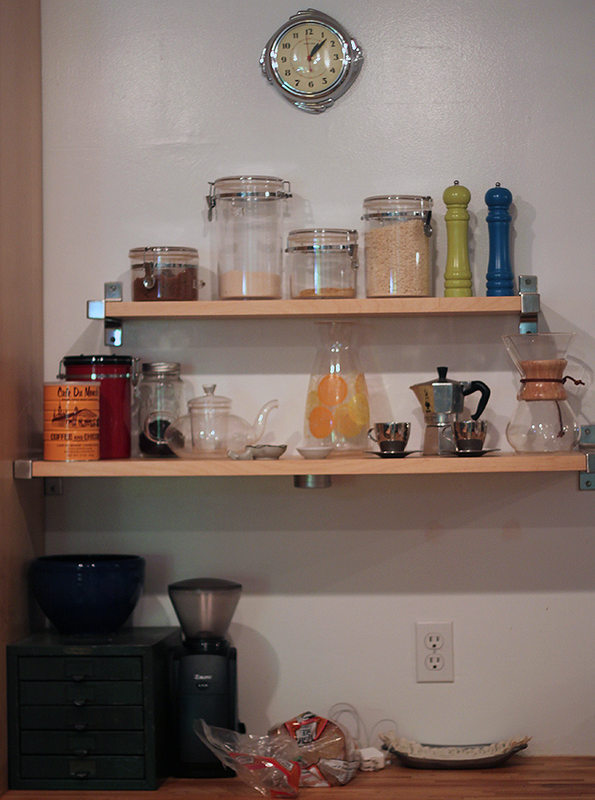 I dream of having a shelf devoted solely to coffee and tea devices, those metal espresso cups are really nice. Good luck with the house hunting! Aw, thank you! The cups are just from Ikea, believe it or not! What a lovely kitchen. It has a really nice feel to the layout. 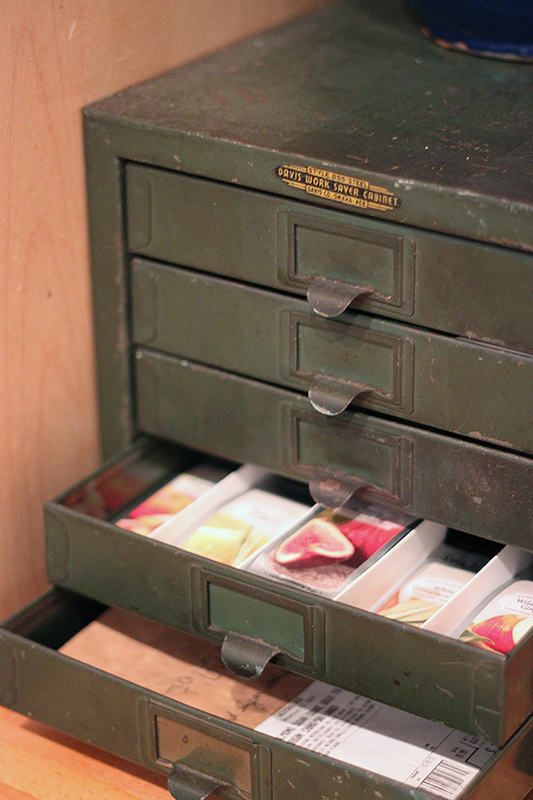 I love your green cabinet for teas. I have something similar that I keep craft stuff in that came from a gallery I used to work at. We have inherited treasures from grandparents too in our kitchen. Good luck with your house search. Thank you so much! And inherited treasures are the best. Wow – your kitchen is GORGEOUS! I love love love your style. Thank you! My partner Steven did a little redecoration recently to add some of these touches.